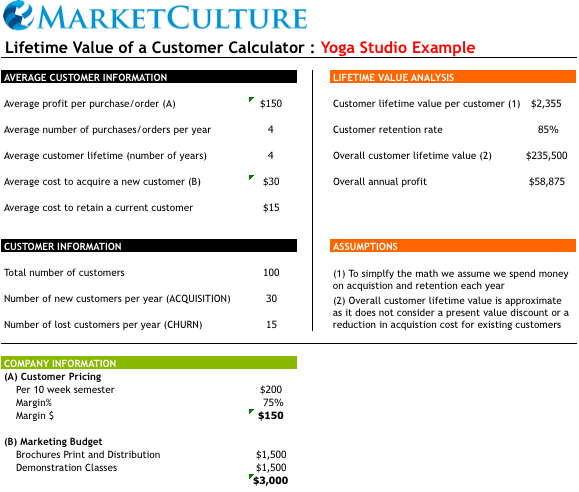 Firstly – The lifetime value of a customer to a yoga studio can be very significant, the average customer in this example is spending almost $2.5k over a four year period! Understanding this bigger picture allows us to make better decisions about the value and importance of even a single customer to our business. Secondly -Acquisition costs a usually higher than retention costs, in this example it costs a full 100% more to acquire a customer than to retain one. The economics demonstrate the value of customer retention. Of course this will vary from business to business but regardless this is an important data point to understand. The key inputs relate to estimating the probabilities of the impact of our sales and marketing activities on customer acquisition and retention.We then marry this with some hard data, i.e, the costs associated with these activities. So what information do we need to begin the analysis? 1. What is the average revenue (spend) and gross margin per customer? 2. What does it cost to acquire a new customer for the first time? 3. What does it cost to retain a customer each year? 4. How often do customers purchase in a given year? 5. How many customers do you have right now and how many do you gain and lose each year? Note: For this example I did not use a discount rate but as a side note we should be accounting for the time value of money. In other words a dollar today is worth more than a dollar in a year or 5 years time. If you would like access to the spreadsheet you can sign up for free at our easyLearn website here. This entry was posted in Life Time Value, Marketing Finance, Marketing ROI, ROMI and tagged linkedin; life time value of customers; ltv; marketing finance; marketing roi; romi; marketing finance. Bookmark the permalink. This is a great tool and even educated estimates of the data will produce useful results to make you rethink your strategy. A good exercise for both marketers and accountants and preferably the two working together.